Beech and ash were commonly used to make golf clubs in the game's early days. Starting as early as the 15th century, golfers carved their own clubs. 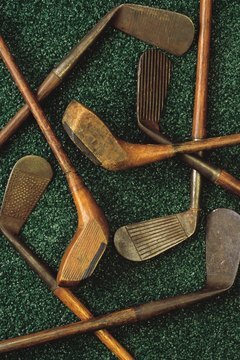 Several considerations -- including imported woods and the evolution of the golf ball -- influenced what types of wood were used to make club heads and shafts. Wooden antique golf clubs are popular among collectors, and some golfers even compete in "hickories," tournaments played with hickory-shafted clubs. In golf's early era in Scotland, golf club makers used hardwood, such as beech, to make club heads. For the shafts, they used ash or hazel. A set of these early "Troon Clubs" -- also known as "long noses" -- consisted of six woods and two irons. According to the Oracle ThinkQuest Education Foundation website, golf balls were also made of wood until the 17th or early 18th century. In Scotland, the type of wood used to make clubs changed with two American imports: hickory for club shafts in 1826 and persimmon for club heads in 1900. According to the Antique Golf Club website, woodworkers in Scotland started using American-imported hickory instead of ash to make hand tools, and that influenced golf club makers to use the same wood for shafts. Because clubs with shafts made of ash are rare, collectors mostly focus on clubs with hickory shafts. In the mid-20th century, both the USGA and the R&A ruled that golf clubs with steel shafts could be used in tournaments.While steel was used for club shafts, wooden heads were the norm for drivers and fairway woods until the 1970s. Persimmon was used for wood club heads because it's harder than maple or oak and it's heavy. Some antique golf clubs are worth thousands of dollars. According to the website, Antique Golf Clubs from Scotland, certain club makers were and still are revered for their craftsmanship. Figuring out the age and value of antique golf clubs is tricky and requires an expert's evaluation. The Antique Golf Club website notes that "many golf clubs made before 1820 used ash instead of hickory for the shafts." "Hickory golf," where golfers use hickory-shafted clubs, is popular with many golfers. Ralph Livingston III recommends on his website, HickoryGolf.com, that hickory golfers assemble the following clubs: brassie, mid-iron, mashie, mashie niblick, niblick and putter. Some companies make modern clubs that have persimmon wood heads, and some companies sell and make clubs with wood shafts, wood heads, or both. How Many Covers Do You Need for Golf Clubs?